The refusal of the International Olympic Committee (IOC) to commemorate the 40th anniversary of the murder of 11 Israeli athletes by Palestinian terrorists with a moment of silence at the Opening Ceremonies of the 2012 Games, is, of course, appalling and indefensible. Deborah Lipstadt states in a piece she wrote for Tablet magazine that the decision is motivated by anti-Semitism. I’m not sure I’d go that far, though anti-Semitism is never far from the surface in modern Europe, but certainly it’s a political decision. Ankie Spitzer, widow of fencing coach Andre Spitzer, one of the Israeli victims at Munich, indicated in the August 6 issue of Sports Illustrated, in a piece on the 40th anniversary of the massacre, that Jacques Rogge, IOC head, had told her that there were more than 40 Arab delegations at the Games. Without spelling that out, his comments clearly suggested that the requested moment of silence might embarrass them as they likely would not want to observe it. (Only Jordan’s King Hussein, among all Arab leaders, actually condemned the terror attacks when they occurred. Palestinian reaction since the Munich massacre has ranged from the attendance of members of the debut Palestinian Olympic team at a memorial to the Israelis held at the 1996 games in Atlanta to recent comments by the head of the Palestine Olympic Committee that the request for the IOC to grant a minute of silence for the murdered athletes was "racist". Make of that what you will.) Whatever the actual reasons for the IOC’s slight, it puts into perspective the two most significant films made on the Munich massacre and its aftermath, Kevin Macdonald’s powerful documentary One Day in September (1999) and Steven Spielberg’s conflicted but memorable drama Munich (2005). They do what Rogge and IOC have refused to do: remember the Israeli athletes and what happened to them at the Olympics. Ankie Spitzer is one of the main interviewees in Macdonald’s Oscar-winning film, juxtaposed for maximum effect with the compelling interview with Jamal Al-Gashey, reputedly the only surviving Palestinian terrorist from Munich (There’s some question now whether that is indeed the case.) Al-Gashey, in hiding in Africa, is matter of fact and unrepentant about what he did, but viewers of the documentary will likely be just as aghast and angry at the German authorities, who, in effect, botched the rescue attempt of the nine remaining Israeli hostages (two were killed in the initial attack in their rooms), a disaster that Ankie Spitzer, for one, blames for her husband’s and the others’ deaths. Sensationalist aspects of the documentary aside (Macdonald’s use of rock songs like Led Zeppelin’s "Immigrant Song," for dramatic enhancement, unfortunately, add a patina of exploitation to the film. Shots of the corpses of the victims, do so, too, but they were necessary to get the full impact of the tragedy across to the viewers. Some of their features were later blurred out before the film was released after criticism from the victim’s families), the meticulously researched One Day in September makes it clear that this tragedy need not have happened. Macdonald though, didn’t know, since it was only just reported in the German newspaper Der Spiegel, the final damning fact against the Germans, that they were tipped off that Palestinians were planning an ‘incident’ at the Games, and essentially didn’t act on that valuable and pertinent information. In fact, shockingly, there seemed to be almost no recognition among the Germans that this was no ordinary hostage situation since the reality that Jews were once again being threatened with death in Germany had historical reverberations that went beyond the actual unfolding events. So did the initial entry of the Israeli Olympic team at the Games’ Opening Ceremonies, marching into a stadium erected not very far from the remains of the Dachau concentration camp, which was dedicated to the extermination of a people now represented with their own state at the games. Yet the Germans refused the offer of help from the Israeli spy agency, Mossad, which had experience with these sorts of matters – as Israel was already subject to terrorist attacks on a regular basis – even though they themselves were patently unqualified to deal with terror attacks such as those at Munich. (This was before the domestic Baader-Meinhof or Red Army faction terror groups were making their presence felt across Germany.) 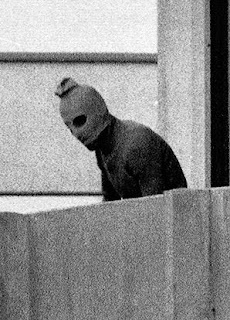 You can bet if British or American athletes were being held hostage on German soil, that the intelligence agencies of those countries would have been invited into any planned rescue attempts. The litany of examples of German unpreparedness is startling and highly disturbing, from the unarmed ‘security’ officials stationed at the Olympic village to the German snipers who lacked body armour and walkie-talkies to communicate with each other during the penultimate, and failed, attempt to save the Israelis. Germany’s reputation for ‘ruthless efficiency’ was put paid at the Games, aptly says Gerald Seymour, then a British television reporter covering the games and now a respected novelist (Harry’s Game, The Glory Boys). 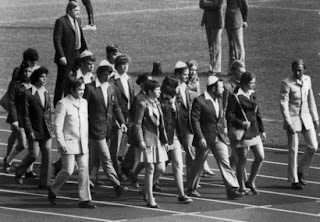 The surviving Israeli athletes at the memorial ceremony the day after the massacre. Equally off-putting was the reaction of the other athletes themselves to what was happening to their sports brethren. For 11 hours after the initial dawn attack on the Israeli compound, the games continued. The athletes continued to train, sun themselves and exchange tips on technique as if nothing was happening just a few feet from them. As Seymour adds, with considerable understatement, their blasé reactions were ‘selfish (and) slightly obscene.” (The Games resumed after a memorial service the next day to the slain athletes, a decision that remains controversial to this day.) I’m not a sports buff anymore, but it’s this particular aspect of what unfolded at the games which forever tainted the Olympics for me, in much the same way as the infamous and anti-Semitic 1975 U.N. General Assembly resolution equating Zionism with racism has done for the United Nations. (There have been plenty of sound reasons since to continue to shun those institutions and view them with suspicion.) And one can’t help feeling, paranoid as it may sound, that, after all these were only Jews being menaced and how much do they really count for in the grand scheme of things? It’s no surprise then that MacDonald’s final revelation in the film is that Germany colluded with Palestinian terrorists in the freeing of the three remaining Munich terrorists in order to stave off attacks on German targets in the future. What I prefer to take out of a film that angered and saddened me so much is the portraits of (some of) the Israeli athletes, from Yakov Springer, who like my late father was born in 1921 in Poland. Springer lost his entire family in the Holocaust only to find himself back in Germany as a member of a sports team representing the Jewish state. Then there was the gentle giant, weightlifter Yossef Romano, who fought against the terrorists and was the second Israeli to die in the attack. His daughter recalls how many Israelis remembered the man after his death. (Ironically, Romano was born in Libya, the same country that trained Al-Gashey and some of the other terrorists and gave a hero's welcome to the freed Black September trio.) And of course Romanian-born Andre Spitzer, an optimist who as Ankie said, saw the Olympics as an ideal of brotherhood and proved it briefly when he bonded with athletes from Lebanon, a country at war with Israel, shaking hands with them and discussing their results in Olympic events. (You can learn a bit more about the athletes in the moving hour long 2006 ABC Sports Documentary Our Greatest Hope, Our Worst Fears, The Tragedy of the Munch Games, which contains interviews with other of their family members as well as Jim McKay, who headed up the ABC coverage of the terror attack and acquitted himself with tact and honour, as well as winning an Emmy Award for his work.) One Day in September, laudably honours the memories of the Israelis when the IOC, to its grave discredit, does not. For filmmakers, Munich provided fodder for several dramas on the event. William Holden and Shirley Knight starred in a forgettable TV film, 21 Hours at Munich (1976). The Robert Lantos-(Barney’s Version) produced Canadian TV mini-series Sword of Gideon (1986) was a clunky and flat attempt to bring to life George Jonas’ 1984 book Vengeance: The True Story of an Israeli Counter-Terrorist Team, which depicted the Israeli response to the Munich massacre. 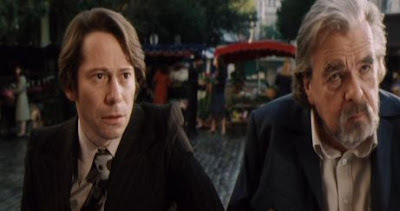 Jonas’ book was also the basis for Steven Spielberg’s Munich, by far the best of the feature films and television productions on the subject, but not without serious problems of its own. Jonas’ book told the true story of an Israeli hit team, formed in the wake of the Olympic tragedy, to exact justice for the murder of the Israelis, by eliminating those Palestinians who had a hand in the planning and execution of the terror attack. Told in the words of ‘Avner', (Mossad agent Yuval Aviv is reportedly the source of the book), Jonas outlined a complex and murky world where the ensuing attempts to kill off the terrorists on the list, and the emotional toll it took on Avner,compelled him to eventually leave Israel and try to make his way in the world. Jonas’ Vengeance clearly delineated the differences between terrorism (the attack on the innocent civilian Israeli athletes) and counter-terrorism (the justified retaliation for those actions), and though Avner came to feel that his Israeli handlers let him down at times, he never once questioned the morality or efficacy of what the Israelis did. I mention this because Spielberg, though defending the book’s integrity in an introduction on the DVD of Munich (others have questioned Jonas’ assertions; I’ve read the book and interviewed the man and have no problem with the veracity of his account) deviates from Jonas’s telling of the tale in several key and lamentable ways. Munich begins with the attack on the athletes in Germany before segueing to Avner (Eric Bana), a young Israeli Mossad agent, ex-bodyguard to Prime Minister Golda Meir (Lynne Cohen), whose wife Daphna (Ayelet Zurer) is expecting their first child. Avner is the son of a famous father, known in army and intelligence circles, who is plucked out of obscurity by the Mossad for a world-class assignment. That job, told to him in a private meeting with Meir, key Israeli generals and the Mossad chief, is to hunt down and eliminate eleven Palestinians, including third in command of the Palestine Liberation Organization, Ali Hassan Salameh, deemed culpable for the Munich attacks. Their field of operation, Western Europe, where Avner’s cynical Mossad handler Ephraim (Geoffrey Rush) says the eleven are residing. (Operations in Arab countries are to be left to the Mossad to handle and Soviet-influenced eastern Europe, is off limits, as who needs the headaches, in Ephraim’s wry words.) Avner is to command a team of four operatives, including Belgian bomb disposal expert Robert (French filmmaker Mathieu Kassovitz (La haine)), South African driver Steve (Daniel Craig, of James Bond fame), document forger Hans (Hanns Zischler) and clean up man Carl (Ciarán Hands). 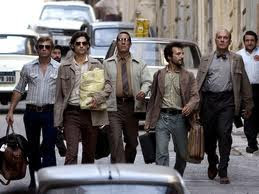 Using a generously funded Swiss bank account, and completely off the books (Avner is forced to resign from the Mossad as a cover), the team are to use anyone and everyone who can lead them to their targets, an order which leads Avner to deal with a murky Frenchman Louis (Mathieu Amalric) and his shady father Papa (Michal Lonsdale) who provide many of the Palestinan names to the Israeli operatives. The film, at least, at first, also captures the Talmudic contemplative nature of what it means for Jews to take hold of their own destiny in a way often denied them in the past. As Golda Meir tells the Knesset, Israel’s parliament, from now on the world will learn that that there is huge price to be paid for taking Jewish lives. Yet, she also muses to herself as to whether the country that she leads is compromising with its own civilized values in taking the actions it does. Much like the figures of the Old Testament, Abraham, Job and Lot, there is a Jewish argument over every act taken and every decision made. 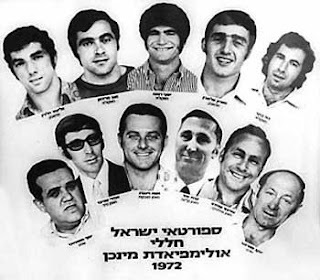 And the five men, tasked to defend Israel against her vicious enemies, are like a family – referring to her need to attend her sister’s funeral instead of those of the Israeli athletes, taking place at the same time, as Meir puts it, “Family Matters," not least to Avner who misses his wife terribly. 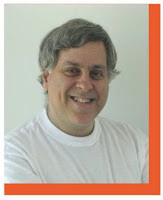 That Jewish family of vindicators of spilled Jewish blood, bonding over brisket, kibitzing among themselves and offering hearty Mazel Tovs to Avner on the impending birth of his child, are unique to intelligence services or secret agents because threats to Israel are often existential in a way they are nowhere else. Israel is also not a rich country so Avner is prevailed upon to keep receipts for all his team's expenses, surely a first for a movie involving spycraft. Bana aside – he’s a weak actor who only aces a few scenes, including a portentous one in a hotel room bar with a comely woman (Marie-Josée Croze) – the casting and acting is flawless. There’s even more than a trace of Graham Greene in the absolutely fascinating characters of Louis and père, the latter a French resistance fighter who considers Gaullist France and the Americans to be as hated and evil as Vichy France and the Nazis were. (He also mentions Stalin, but that comparison makes some sense.) The underlying tension between he and his son Louis was so interesting that it almost detracted from the Israelis at the centre of the action, not a wished-for result from Spielberg, I would think. Again, Spielberg contradicts himself by continually revisiting the scene of the Munich massacre, most crudely contrasting Avner’s making love to his wife as the Israeli athletes are machine gunned by their captors. (He must mean that from death comes passion and life, but it’s a clumsy metaphor nonetheless and beneath his usual high cinematic standards.) If the mission is so problematic for Avner (and by extension Spielberg and Kushner), why keep revisiting the scene of the crime, and in effect showing why the response to it was assigned in the first place? Clearly, Spielberg can’t let the horror of it go or forget its specific details, perfectly captured as they really happened. And if his equation of Munich and 9/11 is foolish (more accurate is the late Peter Jennings’s comment in the ABC Sports documentary, that Munich was actually a primer for 9/11 and an introduction to a post-terrorist world he and other journalists had to cover), the overall raison d’être of Munich remains for him a wish to understand what happened and why. That wish for understanding is a very Jewish approach to tragedy – the opposite of the unquestioning God works in mysterious ways – and when Munich is spot on – not as often as I’d like – it fulfills that dictum. 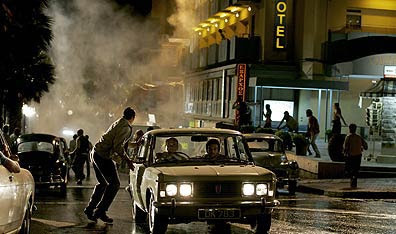 And as irritating as the movie can be – and sometimes out of focus, as Spielberg’s understandable enthrallment with the minutiae of the assassination attempts lets one forget what the movie is supposed to be about – by its heavy emphasis on what actually happened at the games, it, too, like One Day in September, memorialises and pays proper tribute to the murdered athletes. May they rest in peace. Dedicated to the memory of the 11 Israeli athletes murdered by Palestinian terrorists at the 1972 Olympic Games in Munich: David Berger, Ze'ev Friedman, Yossef Gutfreund, Eliezer Halfin, Yossef Romano, Amitzur Shapira, Kehat Shorr, Mark Slavin, Andre Spitzer, Yakov Springer, Moshe Weinberg.